Yoga Vidya Mandiram invites you to join their 100-hour yoga teacher training in Thailand. The special highly intensive yoga teacher training program is dedicated to many students who desire to step into the path of yoga and meditation but are still caught up in the midst of the modern lifestyle that allows only so much time one can take off from the fast-moving life. The teachers have been brought up and spent their lives in traditional ashrams and gurukulams with yoga and meditation as their sole purpose in life. 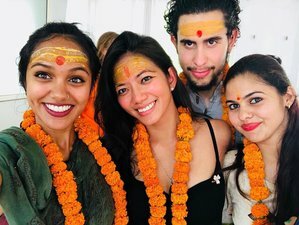 In this special occasion, they are traveling to Thailand with the pure intention of transmitting authentic knowledge of yoga and meditation from the ancient Vedic scriptures. The mission is to spread peace, health, and joy, which can be achieved through yoga. All walks of life are welcome to learn how yoga leads an individual to a healthy body and lifestyle! You will be accommodated for ten nights at Maewin Guesthouse & Resort. The accommodation for the training is a traditional Thai-style second-story wooden house. The 2nd floor has a view of the farmland, forest, and mountains and three dorm rooms (three-four people per room). There is one bathroom in each room, one small kitchen and common space on the first floor. This teacher training is a multi-style program for beginners with basic knowledge of yoga. After the completion of the course, the students will be given a certification of the completion of the 100-hour yoga training program at Yoga Vidya Mandiram School. This 100-hour yoga teacher training will be held by experienced reputed meditation guides and the team of accomplished yoga teachers. Upon completion of this yoga teacher training, students will receive a certificate affiliated with Yoga Alliance USA. Registration with Yoga Alliance USA provides a globally recognized credential. This teacher training is a multi-style program for beginners with basic knowledge of yoga. After the completion of the course, the students will be given a certification of the completion of the 200-hour yoga training program at Yoga Vidya Mandiram School. This 200-hour yoga teacher training will be held by experienced reputed meditation guides and the team of accomplished yoga teachers.